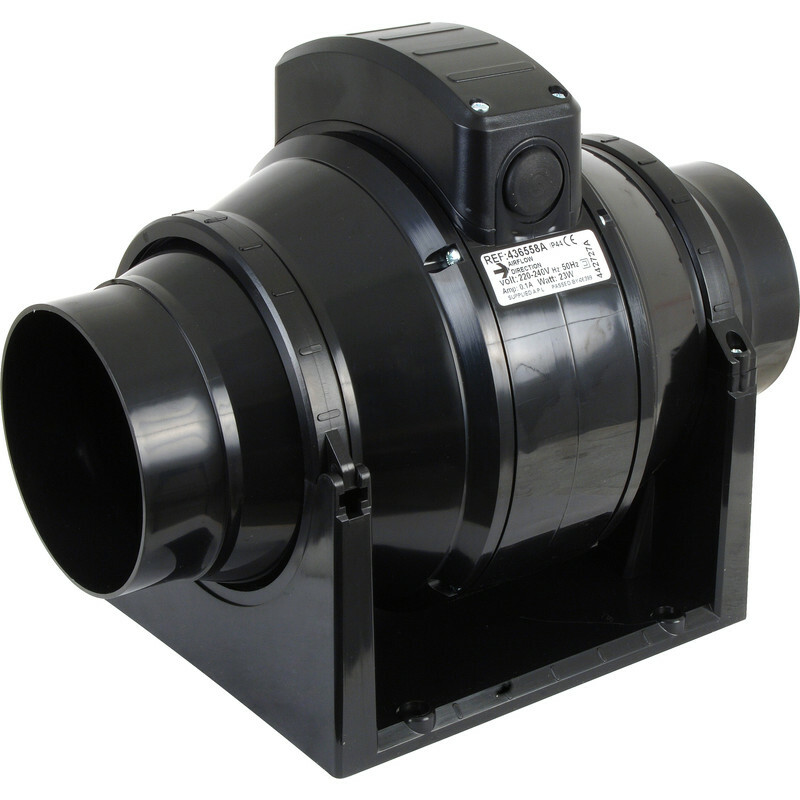 IPX4 part L compliant mixed flow fans develop greater pressure than conventional axial fans making them ideal for use in ducted systems or restricted spaces i.e. ceiling voids. 2 speed fan setting. Low speed 180m3 per hour, 20dB at 3m. High speed 245m3 per hour, 24dB at 3m. LWH: 298 x 168 x 180mm. Airvent 100mm Mixed Flow Inline Extractor Fan Timer is rated 4.4 out of 5 by 35. Rated 5 out of 5 by ViperNigel from Powerful bathroom fan Replaced an existing ceiling fan in my en-suite which had mould & steam issues with this more powerful in-line fan. Now clears the steam almost immediately and being in-line it also reduces the fan noise. Rated 5 out of 5 by dom j from Highly Recommended Good quality, powerful fan, at a good price. Rated 5 out of 5 by FAISAL from Quiet and powerful Has been running it for last one week. My bathroom size is 2x2m. Set the timer to half (30 mins) and power to medium. Very happy with low noise and immediate steam removal which has been creating mould issues. Highly recommended product. Builder reported no issues with installation. Rated 2 out of 5 by None7953 from FLIMSY FIXINGS TO SAVE A FEW PENCE? Connection terminals tiny, flimsy and fixed to a fragile PCB. How much cost would it add to make connection terminals reasonably robust? Pre-fitting of a flying lead necessary: connections and PCB too fragile to connect in situ, eg when sited between joists in a loft The 245 cubic metres per hour air throughput figure is hard to believe when the unit is bench-run and compared to a different fan claiming much lower throughput. Low noise level: the only good point. Not much consolation, because after fitting the unit, it failed after running for only minutes and emitted a burning smell: really not what people want in their houses. Rated 3 out of 5 by DevonDIY from Effective fan... But Just had to replace one of them as the PCB timer has burned out and the fan doesn't start. Nothing actually wrong with the motor or housing but the nasty scorch mark on the circuit board wasn't a comforting sight considering this was in our loft space. Rated 5 out of 5 by daveu from Very powerful, with timer included This is the third of these I've installed. So much better than the standard white effort, which left the bathroom full of condensation. This was easy to install using the existing 3-core flex from the old fan. It's very powerful and clears the condensation perfectly. Recommended. Rated 5 out of 5 by Eeeon from Very good, easy install and quiet. Bought this for a bathroom refit, very good fan. Quiet and effective and easy to install. Will definately use this fan again.